Travel times have improved about 10 percent and ridership is up seven percent, bucking citywide trends. While bus ridership is down citywide — and especially in Manhattan — there are some routes that are bucking the trend. One that’s gaining riders is the M86, which got a package of upgrades from DOT and the MTA in 2015. The improvements included off-board fare collection and queue jumps — short bus lane segments that enable buses to cut ahead of other traffic at signals. Bus ridership in Manhattan has fallen 27 percent since 2007, and until recently the M86 was losing riders too. Between 2010 and 2015 ridership dropped 8 percent. The launch of Select Bus Service in 2015 changed that. 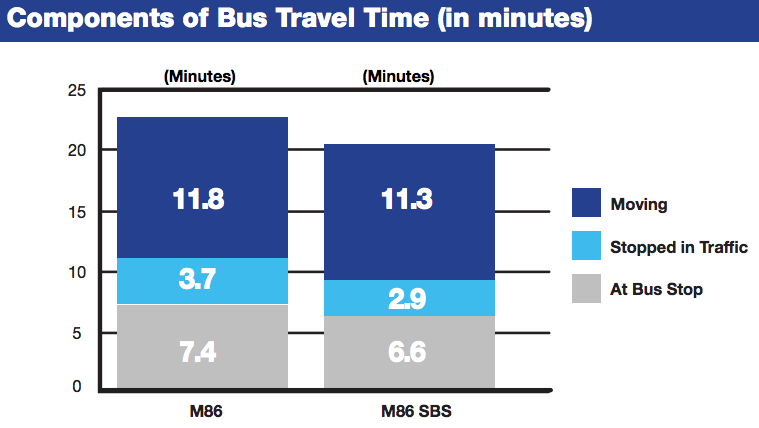 Travel times on the M86 are down 10 percent and ridership is up seven percent as of last September, according to a new DOT report [PDF]. With the queue jumps and faster fare collection — improvements the NYC Bus Turnaround Coalition wants to scale up citywide — travel times are down 11 percent eastbound and 8 percent westbound. Reliability also improved, with a higher share of buses arriving within a few minutes of the scheduled times. Now ridership is on the rise. There are three queue jumps on the route. They were installed before the rest of the SBS features were added, allowing DOT to isolate their effect: a 7 percent reduction in westbound travel times and 30 percent reduction eastbound (which received “more extensive queue jump treatments,” according to DOT). DOT released the report at an event this morning that also heralded the arrival of the Second Avenue Subway, new bike lanes, Citi Bike, and ferry service on the Upper East Side in the last year. can we just paint every right lane red ? While there is no doubt that buses should be made faster, I wonder if the focus should be on ridership alone, but rather on paid ridership without a free transfer. For example, if better bus service means people hop a bus a few blocks to the subway rather than walk, is that really important? The MTA gains no revenue. Exercise goes down. On the other hand if people are hopping across the park by bus rather than taxis, that’s good for traffic. And its a net gain in revenue. With regard to falling ridership, if people are taking the 2nd Avenue Subway rather than the M15, that’s good. If people are shifting to bicycles, which cost nothing and provide exercise, rather than buses, which are deeply subsidized, that’s also good. If lousy service is causing people to drive instead or not take trips, that’s bad. This is really a note to the author & editors: The first graph above indicates that river-to-river travel time overall (both directions) decreased from about 23 minutes to a smidge over 20 (seems low to me, but OK). That would be a 12 or 13% decrease. The next graph doesn’t tell us what units are being measured & compared. It can’t be 4.4 hours; it can’t be 4.4 minutes. Anyway a bus trip goes from taking 4.4 units of time to get from the West Side to the East down to 3.1. This is indeed a 30% decrease, as your label says. However, the east-to-west trip,dropping from 3.0 units to 2.7 units is not a 7% decrease; it’s precisely a 10% decrease (’cause 0.3 is exactly 10% of 3). 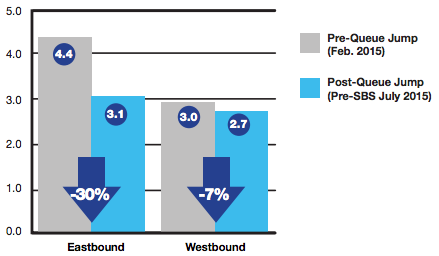 Now, assuming an equal number of east-to west and west-to-east trips, this suggests an average 20% decrease, not the 10% DOT claims. So clearly there’s something screwy with that lower graph. What’s wrong with a free transfer? The whole thing is subsidized anyway; I can’t see the free transfer having any impact on anything, especially “exercise”. The heading, included in the pdf but omitted from the Streetsblog graphic, explains the mystery 4.4: “Comparison of Time Stopped in Traffic (in minutes)” – but it doesn’t explain the mystery 7%.